For the avid dog lover, grooming also entails spritzing its favorite scent so that it will smell fresher and cleaner all day long especially if you’re thinking of taking it somewhere where other people might want to pet it. The good news is that there is perfume for dogs as well as deodorant for dogs that can do such a great job of keeping your hound smelling nice. A dog fragrance should work not only to give your pet a pleasant smell, but also not put it in harm’s way by causing allergies and other possible health concerns. That’s why choosing the best dog cologne, deodorant spray, or perfume is a must. Thankfully, we’ve got that covered. Pet parents will love the formulation of this Gerrard Larriett creation. It’s a pet cologne, puppy perfume, and dog deodorizing spray all rolled into one unique formula. The blend of chamomile and lavender essential oils should help keep your pet relaxed while giving it that remarkable soothing fresh scent. The addition of lanolin in the formula is perfect for dogs with dry, sensitive skin, allowing it to be nourished and rehydrated to give your dog healthier skin and coat. There’s aloe vera, too for additional protection and nourishment of the skin cells especially around your dog’s ears. The antioxidant benefits of Vitamin E are also added while oats help reduce itching, moisturize skin, and restore your dog’s skin’s protective functions. The oats it contains is also what serves as the deodorant for the formula. It’s the kind of cologne for dogs that will never irritate their skin or bring a sneezy surprise to your furry friend. 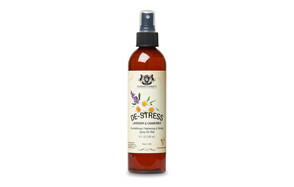 Its pH-balanced formulation allows the Aromatherapy Freshening & Shining Spray to be used on any breed of dog. It’s like giving your pet a daily trip to the spa while making sure that it remains calm, composed, and fully relaxed. It truly deserves the right to be called the best dog cologne spray in the market. Wahl is a brand that is trusted by many pet parents when it comes to pet grooming. After all, they have been in the business of making world-renowned professional human and pet clippers since 1919. It’s no wonder that the brand also provides a deodorant for dogs that should go well with their famed pet clippers. This dog deodorizing spray not only manages your pet’s body odor exceptionally well, it also leaves a more refreshing scent that will last many hours. A blend of spearmint and eucalyptus takes good care of your pet’s skin and coat. Aside from its deodorant properties, eucalyptus is also perfect as a decongestant, antiseptic, and disinfectant, making sure your pet dog’s skin and coat is rid of any potentially harmful microorganisms. The cool and refreshing smell of spearmint gives your dog the kind of freshness that it needs after a day of rolling on dirty surfaces. Wahl’s dog perfume spray comes in an easy-to-spray bottle, although some pet parents claim its design is mediocre. 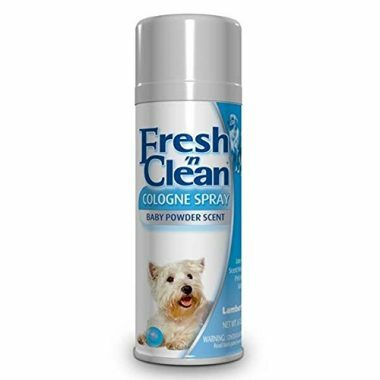 Still, if you can look beyond the imperfections of its spray bottle design, then this product can be considered as one of the best dog deodorant spray products you can find. Formulated as a puppy perfume, the Honeydew Nourishing Pet Spray relies on the remarkable nourishing benefits of lavender and evening primrose essential oils to soothe your young pet and put it at ease. The gentle formulation of Honeydew makes it ideal for hounds that may have very sensitive skin. There are no sulfates or parabens in the formulation which can irritate the skin and leave your dog with more problems than necessary. 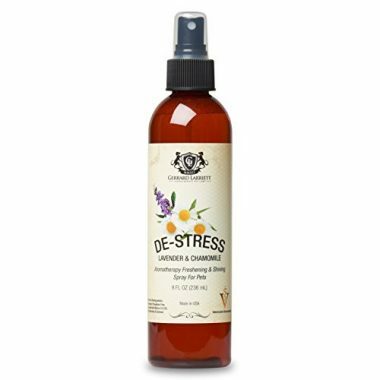 The Honeydew Nourishing Pet Spray stakes its claim as one of the best dog perfume products by leveraging on the full range of benefits of aromatherapy oils. 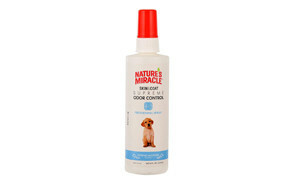 This helps provide dogs with a cleaner and fresher scent while calming them down. It’s a great way to end any grooming session as dogs will be naturally more inclined to sleep more comfortably afterwards. It’s a pleasant way to give your pet a nicer smell, too, after spending some time outdoors. Spritzing the Honeydew pet cologne not only gives your pet a nice scent. It also leaves its coat smoother and softer. 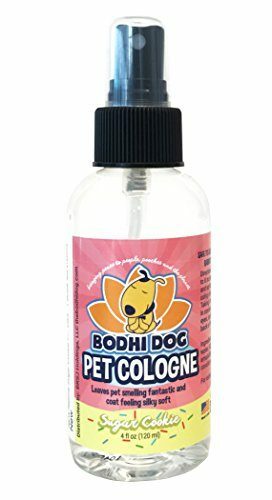 Bodhi Dog’s Natural Pet Cologne offers a lighter, more refreshing scent than the best dog perfume you can perhaps source from the market. This dog fragrance serves both as deodorant for dogs and as puppy perfume because of its gentler, milder formulation. It also has amazing coat conditioning properties that will leave your pet’s coat more irresistible to touch and caress. While there are no indications as to what exactly comprise its so-called ‘natural ingredients’, pet parents seem to agree that it has a much milder and non-irritating scent than some dog and puppy perfume products in the market. 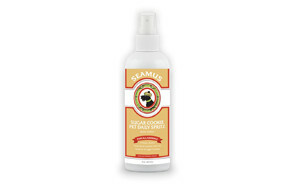 The Sugar Cookie scent is a great alternative to floral and citrusy scents that are typical of cologne for dogs. There are natural conditioners in the formulation of the Bodhi Dog, too, allowing your pet to enjoy tangle-free coat regardless of how active it is outdoors. The formulation of the Bodhi Dog perfume for dogs is spot-on, especially when used in between bathing. At least, no one will be complaining about how stinky your dog is. Featuring a unique blend of botanicals that serves as its odor-control system, Nature’s Miracle Skin & Coat Supreme Odor Control Freshening Spray is perfect for canines that may have issues with body odor. This dog deodorizing spray comes with aloe vera which should help condition and nourish your young hound’s coat and skin, giving it a more vibrant glow while imparting a scent that effectively neutralizes the not-so-pleasant odor that may emanate from its body. Its 4-in-1 action neutralizes pet odor, eliminates unwanted scents, freshens your pet’s coat, and conditions it so that it will be fluffier, bouncier, and healthier than ever before. The formula is free of parabens, dyes, or soaps. It’s good for dogs that may have sensitive skin, making sure that your pet’s natural oils on its skin are properly maintained. It also works well with spot-on topical applications of flea and tick medications so you’re effectively giving your pet a nicer smell than the otherwise strong odor from the medication. Nature’s Miracle deodorant for dogs is a great alternative to other dog cologne spray and deodorizers especially those that are quite pricey. Natural citrus oil has been used for centuries in the management of a variety of odors. 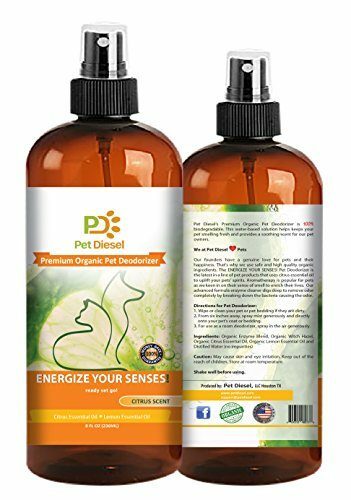 Pet Diesel harnessed this amazing property of lemon and citrus essential oils and combined it with the benefits of witch hazel oil to reduce inflammatory conditions on your pet’s skin. It’s a good way to minimize itching in your pet. Pet Diesel’s dog deodorizing spray also features a proprietary blend of bioenzymatic systems that help break down microorganisms that produce the nasty smell in dogs. It is the combined action of enzymes and citrus that give the Pet Diesel dog fragrance its remarkable deodorant properties. If you don’t like the smell of lemon or citrus, Pet Diesel also comes in peppermint & eucalyptus, lavender, and baby powder formulations. Regardless of the scent that you want to get for your pet, you can rest assured that the bioactive enzyme system is ever-present. Lambert Kay’s rendition of the best dog cologne is the Fresh & Clean. Available in baby powder, tropical, floral, and clean scent, the Lambert Kay dog fragrance formulations are one of the simplest yet equally effective fragrances for hounds. It doesn’t come with anything fancy except that its formula boasts of only the finest quality ingredients. Pet parents can attest to the effectiveness of Lambert Kay’s dog cologne spray, further saying that other people seem attracted to the baby fresh scent as if you’ve got a baby at the end of your leash. Of course, that would be totally absurd. But it does underscore the point that this dog perfume spray is one of the best if you want your baby dog to smell really nice. If you want your dog to be the best-smelling hound ever, then you’ll definitely give Lambert Kay a try. This is on perfume for dogs that mimics the natural intricacies of male and female species. Whereas most pet cologne products create variations based on the scent, Natural Rapport utilizes the gender of dogs as a basis for the formulation of its dog fragrance products. A closer look at its ingredients say there really isn’t any distinguishable difference between its male and female formulations. Both contain plant-based surfactants mostly based from palm and coconut. Perhaps the only difference is in the fragrance that is included in the formulation for either male or female. The Male version is obviously stronger, earthier. The Female variant borders on sweet innocence and a carefree spirit. Either way, you’d still be giving your pet Natural Rapport’s triple action formulation: odor neutralizer, coat conditioner, and coat and skin moisturizer. 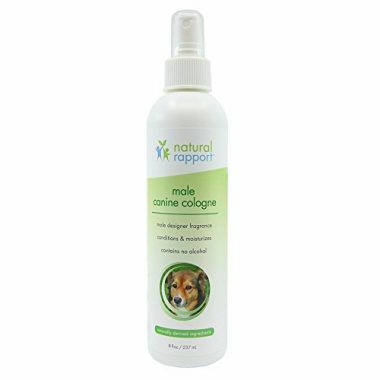 One of the best dog deodorant spray products in the market, you’d be glad to have the Natural Rapport on your dog’s coat in between bathing. If you fancy a human perfume-inspired cologne for dogs you might give Four Paws a try. Each of its 4 variants closely resembles some of the most recognized fragrances in the human population. For instance, the Gold variant gives you hints of Elizabeth Arden’s Sunflowers while the Silver variant reminds you more of Elizabeth Taylor’s White Diamonds. The Black version is Four Paws’ interpretation of Brut Cologne while the Red is more characteristic of Calvin Klein’s CK One. It’s the kind of dog fragrance solutions you’d want your pet to have for those occasions when they’d be smelled by people other than you. You clearly don’t want to be mingling with other folks when your dog smells like rotten tomatoes. At the very least, you can always feel confident that your dog will smell really fragrant wherever you decide to go. 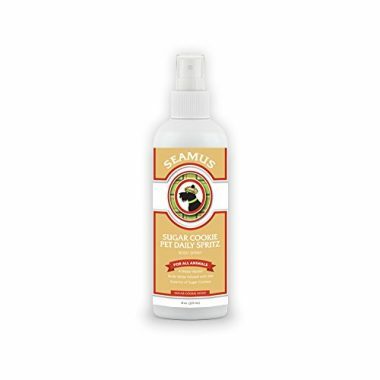 This SEAMUS formulation for the best dog deodorant spray features a noteworthy combination of water-based fragrances that capitalize on the sweetness of sugar cookies to give your pet a smell that should last several days. Not only is the Sugar Cookie a great deodorant for dogs, it can also be spritzed onto their beddings, crates, and other surfaces that they tend to leave their scents on. The Sugar Cookie boasts of the Pharmasome technology that is based on the principle of Liposome action. The ingredients of Sugar Cookie are absorbed into the pet’s outer skin and stays there to keep on releasing the fragrance for a few days. This means you don’t need to spritz the Sugar Cookie onto your pet every day. The Pharmasome technology of the SEAMUS Sugar Cookie makes it a great choice when it comes to longer-lasting freshness for dogs. At least, your dog will smell nice, clean, and fresh for a few days before requiring another spray of the Sugar Cookie. One of the most important things you really have to look for in a dog perfume, cologne, or deodorant is its safety. This is best exemplified in the list of ingredients used in the formulation. As much as possible, stay away from products with very harsh or harmful chemicals such as sulfates, parabens, phosphates, and the like. As for dog colognes, choose one that is water-based, not alcohol-based. Most alcohol-based fragrances tend to turn the skin dry and more prone to irritation than usual. Since dog fragrances are essentially a mixture of a variety of chemicals – natural or synthetic – it is crucial to perform a test application first. Even a perfume for dogs that has all-natural ingredients can cause allergy in susceptible dogs. As such, it is better to be safe than later on be sorry. You can apply a little spritz of the pet cologne onto a small area of your dog’s body. Leave it on for about 24 hours before checking on it if redness or any other sign of skin irritation appears. If there are signs, you may want to get another dog perfume spray. You may also want to check the scent of the product. Different folks have different preferences. Some love the scent of lavender while others are repulsed by it. Most love fresh baby powder scent, although you may not really have an idea if you like the smell if you don’t have the slightest idea of how a baby powder smells like. Choose one that both you and your pet will enjoy. Generally speaking, if your dog is diagnosed with skin allergies or highly sensitive skin it is often wise to steer clear of any fragrances whether it is cologne, perfume, or deodorant. Why Use a Pet Perfume, Cologne, or Deodorant on Dogs? There are two fundamental reasons why people use fragrances on their dogs. First, it can be made as part of regular grooming. Having trimmed the fur, taken a bath, clipped the nails, and cleaned the ears, applying fragrance is like second nature. This is to further extend the purpose of grooming which is to make sure that your dog smells nice, fresh, and clean. This is especially true for dogs that don’t require very frequent baths. The scent of a freshly-bathed dog doesn’t really stay for long. Depending on the activities of the dog, the fresh and clean scent afforded by bathing can easily dissipate within the day or perhaps a few days. Between this period and its next scheduled bathing, you’d also want your dog to retain its nice and pleasant smell. This is where perfumes and colognes can come in. Second, in instances when your dog has gotten really smelly because of its adventures outdoors having a dog deodorant spray can really come in handy. For example, your dog may have gone out walking in the rain or ran through the brush. You have the option to give it a bath, of course. But if this is not feasible, then you may want to use a deodorant for dogs instead. This should help eliminate or control the odor emanating from your pet’s body. It’s a temporary solution until you can bathe your dog again. We’ve been talking about dog colognes, dog perfumes, and dog deodorants. But what exactly are they and are there any differences among the three. Colognes and perfumes are fragrances designed to mask or hide the nasty odor or bad smell from your pet. It’s like replacing the bad odor with something more pleasant to the nose. These don’t address the problem that is partly causing the nasty odor in dogs. Instead, they mask it. The difference between cologne and perfume is the strength or concentration of the key fragrance ingredient. Generally, perfumes contain anywhere between 15 and 40 percent of the pure fragrance or perfume extract while colognes will only have about 2 to 5 percent. Perfumes also have an oilier or thicker consistency since they contain more essential fragrance oils. Colognes will usually have a more watery consistency. Dog deodorants, on the other hand, address the problem of nasty odors in dogs. These are often formulated with enzymes or other substances that can break down the bacteria and other microorganisms that can cause bad odors. Q: Is dog perfume safe to use? A: Perfumes or fragrances that are specifically designed or formulated for dogs should be safe, especially if they meet the standards set by reputable organizations such as the International Fragrance Association. It should be understood that perfume for dogs can have the same ingredients as those products used by humans. 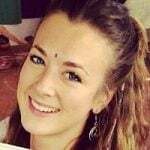 However, the chemical formulation will be different especially in terms of the concentration of essential oils and other substances that constitute the fragrance of the product. This is to make sure that allergies and skin reactions are kept to a minimum, if not optimally eliminated. While the macroscopic anatomy of dog skin is somewhat similar to human skin, there are several differences at the microscopic level. Taking this into consideration, the perfume for dogs should have a different formulation to ensure its safety. Q: Can I use my regular perfume on my dog? A: Owing to the different strengths of fragrances used in the formulation of human perfumes compared to a perfume for dogs, under no circumstance should you spritz your own perfume or even cologne onto your dog. You may think it is mild or gentle for you, but it could very well be harsh on your pet causing allergies and skin reactions. Q: How do I apply dog perfume? A: Applying a dog perfume is essentially similar to how you spritz perfume or cologne on yourself. The spray nozzle should be positioned at least 6 inches from your dog’s coat. Care should be taken not to spritz any perfume or fragrance into your dog’s eyes, nose, mouth, and ears. Put a couple of spritzes on your dog’s back and chest. If your pet has a thick or dense coat with long fur you may want to put extra. Alternatively, you can spray the pet cologne onto your hands before gently gliding your hands over your pet’s coat. For some pet parents, this is a lot more effective since they can easily control the amount of perfume as well as the exact placement of the fragrance on the dog’s body. Q: What if my dog has an allergic reaction? A: Even if the best dog perfume is made of the safest possible ingredients, idiosyncrasies between and among dogs can still produce an allergic reaction or hypersensitivity reactions in susceptible dogs. That is why sometimes a test application is conducted first before using any particular product, especially if your dog has a history of allergic reactions. In the event that an allergic reaction occurs you can wash your dog’s coat with warm water followed by the lathering of an appropriate dog shampoo. Make sure to rinse it well and dry it thoroughly. However, if the irritation persists it is important to consult with your veterinarian. He may be able to provide anti-inflammatory medications or even antihistamines to help in the alleviation of the allergic manifestations. Q: Can I use it for myself? A: Perfumes, colognes, and deodorants for dogs are especially formulated for your canine friend. While you’re more than welcome to try, it is best not to. It’s not that it will be harsh on your skin, but rather we don’t want you smelling like the very pet you are carrying in your arms. Q: How long will the scent last? A: Depending on the formulation of the dog fragrance, the scent can last as short as 4 to 8 hours to as long as 20 to 24 hours. One also has to consider the type of coat that dogs have. Short- or smooth- haired single-coated dogs will have fragrances that last longer. Dogs with long hair and dense double coats will usually require more frequent application of the perfume since this dissipates a lot faster. Q: Can I spray this on my new puppy? A: Even if the product says it is a puppy perfume, you’re not supposed to apply any fragrances on puppies younger than 6 months of age. Their immune system is not yet fully mature at this time so nobody knows how a puppy will react to the application of a generally-mild substance. These formulations may be mild in the general context of dogs; however, the implication is that their bodies are already fully capable of processing the various chemicals that may be inherent in such products. With chamomile and lavender providing the core of natural ingredients alongside aloe vera, Vitamin E, pro-vitamin B5, lanolin, and oats, the Gerrard Larriett Aromatherapy Freshening & Shining Spray for Pets got our nod for the best dog perfume in our list. Its pH-balanced formulation and amazing blend of all-natural ingredients make it a safe and effective formula to get rid of your dog’s odor, provide a fresher and cleaner smell, nourish and hydrate its skin and coat, and prevent and / or manage skin inflammation, itching, and other signs of skin irritation. It also has a calming, soothing, and relaxing effect, too, making it a great choice as an aromatherapy for stressed-out dogs. Choosing the best deodorant for dogs, perfume, or cologne means looking at the overall safety of the product, especially in terms of the safety of its ingredients. It may smell nice and pleasant, but if it is going to cause severe allergies or skin irritations on your pet you can definitely forget about it. Your pet’s safety should always take primacy over any attempts to make your pet smell good.